If your future includes a move to Camarillo, check out Meathead Movers! Our professionally trained student-athlete movers, moving concierge, and princess packers are prepared to get you safely moved into your new Camarillo home. 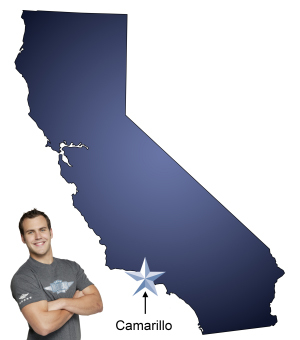 When you make your move to Camarillo, be sure to contact Meathead Movers. No matter what type of moving service you need, our student-athlete movers are ready to handle all your moving needs. The beautiful coastal city of Camarillo is situated on Highway 101 about halfway between the cities of Los Angeles and Santa Barbara. While once considered a remote suburb of Los Angeles, Camarillo offers easy living with its enjoyable blend of rural life near the big city. Enjoy concerts in the park, shopping at Camarillo Premium Outlets, or a stroll through historic old-town Camarillo or Camarillo ranch. There is plenty to see, do, and explore in Camarillo, so it is no wonder more people are moving to Camarillo now than ever before. Luckily, Meathead Movers is here to lend a quick and careful hand. Actually, we offer a whole skilled crew of hands. Meathead Movers is unique among Camarillo movers—we offer high-quality services that the other guys just can’t match. Meathead Movers provides excellent part-time employment for student-athletes throughout Ventura County. We hire energetic and athletically-minded fellows who manage your move quickly and carefully. You may have noticed other Camarillo movers taking it easy between loads. When a moving crew takes a lot of breaks moving day takes forever. Meathead Movers are well-known for jogging when not carrying a load. When you want a crew of careful yet enthusiastic movers, Meathead Movers is the locally-owned company to call on. Whether you are coming from somewhere far away or are simply moving across town, we can meet all your moving needs. We provide first-class local, long-distance, and commercial moving services and we are the only moving company that fully guarantees every move we manage. We are a full-service moving company. If you need help your furniture and possessions, we can happily accommodate you with our climate controlled storage facilities. We can also provide all the cartons, boxes and furniture pads you’ll need to get ready for the big day. If you need help packing up your belongings, just ask. Our Princess Packing service is careful, considerate, and competent. Additionally, if you need help finding service providers in your new area, our complimentary moving concierge service is here to help you seven days a week. When you want to hire a skilled crew of Camarillo movers who will treat your household goods with care and expediency, choose Meathead Movers. Contact us today, if you are ready to learn more about our one-of-a-kind moving services or if you would like a free no-obligation moving quote. You can easily reach us via the form on our website or dial (866) 843-6328. We look forward to assisting you on your move to Camarillo. Moving to Camarillo? Here are some helpful resources. The guys all worked very hard but I had a huge amount of boxes and crates on the side of my home neatly stacked and they way the stuff was put back in my garage was not ok. They basically just dumped it down in my garage, I kept saying I want to be able to put my car in the garage and they kept creeping in and in until there was almost no space. I had it stacked along a wall very neatly and it was just dumped into the garage!! I hired you and spent $4k on your service because I’m hurt and my wife is hurt. So I pay $4k to have to spend my entire day today organizing my garage. It should have been put back in a orderly fashion and carefully organized. I gave them a good report card because they were obviously not trained correctly and they are young kids trying to make a buck but it’s realky unexpectable. I for sure won’t be recommending you. $3900 is a lot of money! I could of rented a truck and hired some guys on Craigslist and they would have done the same job for 1/2 the cost and I wouldn’t have had to spend my day cleaning up your mess. I’m extremely disappointed to say the least and now hurting from having to do it myself. Is fast more important than neat and organized? I feel like I was robbed. My military friends move constantly and I won’t be telling them to call you. And again it’s not the kids fault , it’s your fault for training them this way. Also I asked that it be loaded room by room so it would be easier on my 6 animals and was told no. I was also told once they were already at the house in the morning that there was a long list of items that couldn’t be loaded!!! It would be nice to know about that before hand. I now get to drive 125 miles back to my house to pick up gas cans, co2 tanks, cleaning supplies and even other liquids! WHY WOULDNT YOU TELL PEOPLE THERE IS A HUGE LIST OF ITEMS YOU WONT TAKE? ??? I had to remove over 30 light bulbs from several huge shop lights. I’m just flabbergasted !!! Very friendly and professional. Also worked very fast while being very careful. They were concerned about our needs and worked with us on our budget. Stephen and Pedro were great communicators and did a wonderful job of wrapping and moving furniture. I commend them and recommend the total service package that Meadhead Movers provides from start to finish! Thank you! !